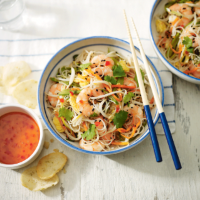 Add some Eastern inspiration to your menu of midweek meals. This recipe is great for when time is short but you still want to inject a little excitement into dinner. 1. Heat 1 tsp of the oil in a wok and cook the eggs for 1–2 minutes, stirring until set. Transfer to a small bowl. 2. Heat the remaining oil in the wok, and cook the beansprouts and noodle cut vegetables over a high heat for 2 minutes. Stir in the noodles and prawns, and cook for a further 3–5 minutes, adding the scrambled egg back for the last minute or so until the noodles are piping hot. 3. Remove from the heat, add the sweet chilli sauce, lime juice, soy sauce and sesame seeds and toss well together. Divide between bowls and scatter with coriander leaves. Serve with vegetable crackers and extra sweet chilli sauce on the side. Cook’s tipTry swapping the prawns for leftover roast chicken, cut into chunks.